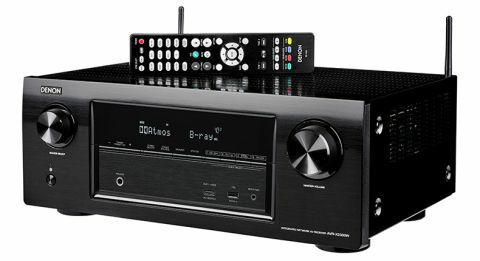 Denon AVR-X2300W review | What Hi-Fi? We don’t envy Denon and the task set before the AVR-X2300W. Designing a replacement for the excellent AVR-X2200W can’t have been an easy task. This Award-winner marked a return to form for a brand that has struggled by its own high standards in recent times. The X2200W rolled back the years with a combination of excellent sound and a feature list no rival could better. So how do you replace an Award-winner? Judging by this new amplifier Denon’s answer seems to be, ‘very carefully’. At first glance, a comparison between the old and new models suggests little has changed. They look all-but identical, sharing a well thought out control layout and clear display. Round the back, the X2300 features slightly reorganised connections, but the company’s determined drive to make its AV amps more approachable keeps things as simple as they can be without compromising usability. Denon hasn’t skimped on the connections. This amp has eight HDMI inputs, all capable of 4K 60Hz pass-through and HDCP 2.2 certified. Others include a sensible spread of optical digital and analogue stereo inputs plus legacy analogue video options such as composite and component. While not a major omission, it’s interesting to note that there isn’t a digital coax available. Elsewhere this amplifier is about as loaded as these things get. It will decode all current home cinema sound formats from Dolby and DTS, including Dolby Atmos in 5.1.2 form. The ability to handle DTS:X is a software upgrade away, expected later this year. Spotify Connect, Airplay, Bluetooth are all supported, as is Internet radio and streaming from a NAS device on your home network. Denon has tried hard to make this amplifier stable when using wi-fi, even in electrically noisy environments, and it works well in our test rooms. Helping matters is a new-found ability to work in the 5GHz waveband along with the 2.4GHz of its predecessor. Even so, given a choice we would still stick to using an Ethernet cable for the extra stability it provides. The 2300 will stream just about every format across a network including 24-bit/192kHz PCM and DSD in both single and double speed form. The latter, along with the ability to stream AIFF files, is new for this model. The X2300W’s power output is unchanged from the last version and rated at 7 x 150W per channel. Impressive, but it should be noted that – just like every other major AV amp manufacturer – Denon is quoting figures measured under very generous conditions (six ohm load, 1kHz, 1% THD and only one channel driven). That output drops to a claimed 95W per channel into an eight ohm load, measured across 20Hz-20kHz with distortion held at 0.08% and two channels driven. The latter is closer to the way measurements are taken with traditional two-channel kit. While the headline features have hardly changed between this and the last model, it is clear that Denon has put in a lot of work at circuit level. Component quality has gone up and great effort has been made to reduce noise levels, both electrical and mechanical. Signal paths have been shortened where possible, and components redesigned to optimise performance. The company has worked hard on the digital section. The DAC chip itself remains unchanged – it’s a Burr Brown PCM1690 – however redesigning the surrounding parts has improved its performance, as has the retuned power supply. A new power supply for the on-board MW/FM radio tuner is designed to reduce any interference from the radio circuit, which also helps to raise the overall sound quality. Set-up is as easy as it gets. Denon has gone to a lot of trouble over recent years trying to simplify its AV amps without compromising features, and we think it has done a fine job here. There are a few tweaks over its predecessor, but on the whole the experience is pretty much the same. That is to say, really good indeed. The menus are simple and easy to follow, while the built-in Audyssey auto set-up system is accurate and fuss free. The company not only supplies a dedicated microphone for auto-set-up purposes – par for the course – but also a folded, adjustable cardboard mic stand. Assembled from three pieces, it holds the microphone at an appropriate height. It’s worth going to the trouble of doing this, as it will give you more accurate results. Go through the whole Audyssey process and you’ll have to take multiple measurements. It’s a bit tedious, but you only have to do it once. Once all the readings are taken it’s a good idea to check them for accuracy. In this case no correction was needed. For critical listening we recommend keeping the various Audyssey processing modes off and sticking to the plain vanilla set-up. It works best in our experience. The remote looks unchanged from last year and is none the worse for that. It’s a neat unit with clearly labelled buttons and an intuitive layout. We like it. We’re far less taken with Denon’s 2016 control app. We tried both iOS and Android versions and neither proved particularly stable, crashing on a regular basis. Our reference system is made up of Cambridge’s CXU Blu-ray player, the Panasonic DMP-UB900 4K Blu-ray player and PMC’s Twenty 23 7.1 surround package, coupled to KEF R50 upward-firing Atmos speakers. Epson’s EH-TW7200 projector carries out display duties. Once up and running the X2300W sounds beautifully balanced. We use it in a variety of modes – 5.1, 7.1, stereo and Dolby Atmos 5.1.2 – and it never fails to impress. We start off with a Blu-ray of Pixar’s Brave and like what we hear. Voices are rendered beautifully. There’s weight, natural warmth and articulation in the midrange that leaves most rivals sounding mechanical in comparison. This amplifier is great at subtleties. Low-level dynamic shifts are delivered with skill and without overstatement. It all helps to draw the viewer more into the action on the screen. As the film approaches its finale, the amp is happy to move up through the gears delivering a spacious soundfield packed with stable and precise movement of growls and screams. The bear fight is delivered with plenty of enthusiasm and no shortage of punch. This Denon can play loudly too, certainly enough to fill all but the largest of rooms. Moving onto the ludicrous but fun San Andreas shows that this Denon lacks little in terms of scale or authority. We watch as building after building collapses and love the aural impact the amp produces. There’s plenty of attack and floor-rumbling bass but also a good supply of detail, so we’re never left in any doubt as to what’s happening. Some rivals may deliver the sound with greater muscularity but the 2300’s combination of insight, agility and refinement are hard to look past. It’s a polished performer that never fails to entertain. The story remains positive with stereo music. Whether you listen through the line stages, HDMI, optical or Bluetooth, the Denon’s easy-going balance remains unchanged. While no substitute for a decent stereo amp such as the Marantz PM6005 – no other similarly priced AV amp we’ve heard is either – the 2300 renders a cohesive and musical presentation that it’s hard not to like. Tonally, things are slightly on the smooth side of neutral, just as they are with multichannel soundtracks. But, it’s nicely judged and only goes towards making less than perfect recordings (and sources) sound more acceptable. The big question is whether the 2300 is better than its predecessor. We unpack our reference sample of the AVR-X2200W to find out. Such things aren’t always a given, but in this case we’re pleased to report that the new amplifier is notably cleaner sounding. It picks up a greater amount of low-level detail and is more precise with it. Voices come through with improved clarity and precision. One of the biggest upgrades is at bass frequencies where the 2300 sounds far tauter and more agile, making the older model sound a tad soft and ill-defined in comparison. Where does that leave the X2300W? It’s clearly better than its talented predecessor, and delivers the same fuss-free user experience. The price is unchanged, so that makes this new one even more of a bargain. We’re awaiting new models from the likes of Yamaha, Onkyo, Pioneer and Sony, but as things stand this is the finest £500 AV amp you can buy right now.